2K4 is NOT a good representation of Zoom. Finally someone with some sense ! I hated the 2K4 - no cushioning, no containment. WASPS ANDD ASPS, nikekid6, jonchilly and 2 others like this. Not to get off topic but I actually really enjoy the 2k4. I can understand why the lack of cushioning is a put off, but I was surprised by how much I enjoyed the forefoot cushion. I wish it was a full width forefoot bag, but the met bag was thick enough to suffice. The heel Zoom is ridiculous in those, at least in the most recent retro. How do you get the Harden Vol 3 discount in store? 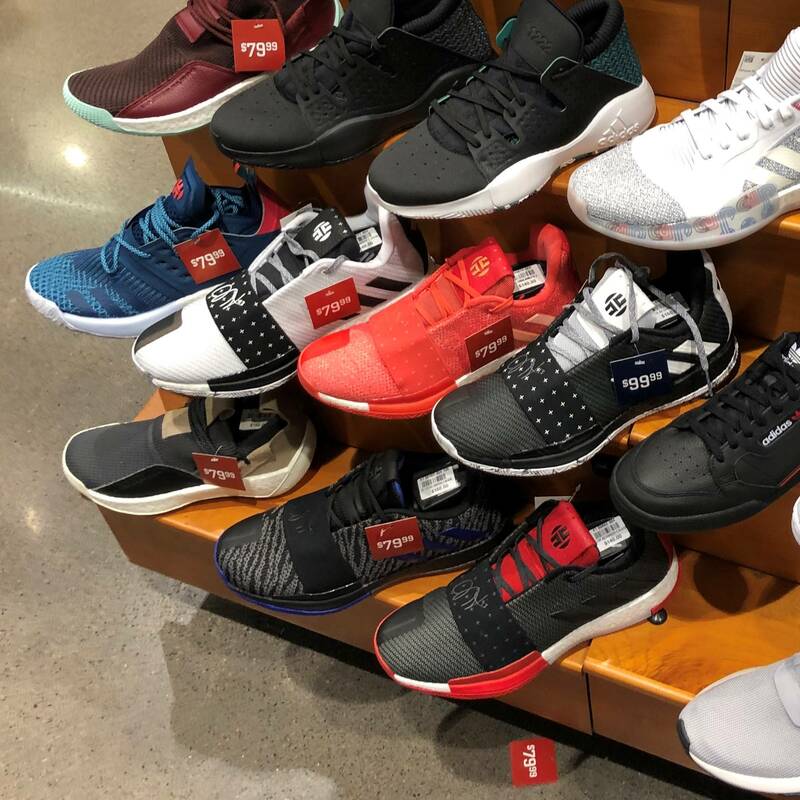 Not speaking from experience, just what I've read on NT: go to a Foot Locker/Champs and have them stock locate a shoe in your size. Might be helpful to pull up the product number from the website for the specific color you're looking for. Taken on 1/22 at Champs MOA. The loose $79.99 tag on the ground I believe belonged to the Pioneers (black/red). Can’t see a pic, but if I can get those white/blue ones on sale I’d jump on them. They might be an adidas.com exclusive though? CosmicGhostRider, brian blades, peteweezy and 2 others like this. I’ll be champs bound tomorrow. I like that red one. I see the pics the second time. My bad I thought everybody in the thread was doing it for the 2's and the 3's weren't on sale yet. See I need to hit up Champs. Thanks for the heads up. I assume this has been posted but with the Vol 1s I noticed a huge difference with the leather ones vs non. Does anyone now how the leather in vol 3 is vs non? Any difference. I wanna get the all white ones. No one knows because the first leather pair, the all white one at Footaction, just dropped 4 days ago. CosmicGhostRider and dubnation like this. My Champs let me use everything from my FootLocker account as if they’re the same (because they basically are, share the same system). They even price matched my Vol 2 based on the price I paid for them from FootLocker. brian blades, si3n4 and dubnation like this. That includes the rewards? Associate had shut this customer down when they wanted to use a VIP Ftl coupon in champs. It could be by location, but yea when I purchased my Vol 2 they added the VIP points to my account for purchasing. brian blades and kingjay718 like this. MoneyAmeer, kg21, brian blades and 1 other person like this. Have his all stars leaked yet at all? I might’ve missed it. When I went to get the Vol 2 from Champs they scanned the barcode and it came up as a higher price than I anticipated. They then said (again, this is Indianapolis location) they could just price match against my FootLocker purchase I had made (they needed the receipt from that Ftl purchase to prove it was 49.99, even though it was a different color way). They then looked up my account by phone number and it pulled up my Ftl account with all my address, email, etc filled out exactly the same. I shouldn’t have spoken so soon I’m saying that they applied my purchase points because I don’t know that 100%, but the receipt that came in my shoe box (the large piece of paper with a picture of the shoe you purchased) was literally the same as my FootLocker one with Champs written instead.